That moment was for Brigadier General Lewis A. Pick, the greatest event in his military career in the Corps. of Engineers, which began with his graduation from Virginia Polytechnic Institute in 1917. For, as the first of the big trucks towing artillery pieces crossed the border into Wanting on the Burma Road, the general officially opened the Ledo Road lifeline to China and delivered successfully onto China soil the first token consignment of vital war supplies to our beleaguered allies. Ahead of the convoy, far beyond the purple haze of the Himalayas and the perpendicular gorges of the Salween, is Kunming. Ahead are the cheering multitudes, the feasting, the dragon dances through narrow streets and the ceremonies acknowledging the opening of the first land route to China since the fall of Rangoon and the severing of the Burma Road supply artery in 1942. Ahead are the speeches, the hand-shaking, the toasts and the pledges. All that belongs to the world - a symbolic promise to the oppressed everywhere that deliverance is near. But this afternoon belongs to Pick and his hard-bitten Engineers who built a military highway through the roughest terrain in the world. It belongs to the legion of service troops which supported this engineering project. And, it belongs to the fighting men, American and Chinese, who pushed the Japs back from the path of the road so the bulldozers, the graders, the demolition men could forge ahead through the jungle. 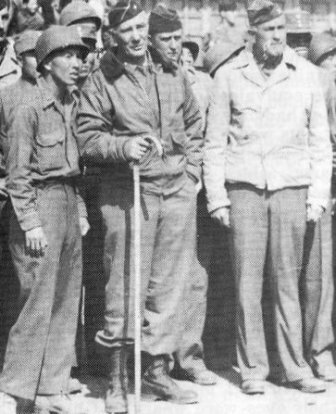 Today in Wanting, Pick told those assembled on the China border, "The lion's share of the credit for the opening of this new route must go to the Chinese, American and British combat forces who have fought their way through the worst possible terrain to drive back the Jap invader. They have made possible the efforts of the Ledo Road Engineers who hacked the road over mountainous jungle terrain on the very heels of the combat forces. For more than two years, our Engineers - American with the help of Chinese and Indian - proceeded to carve out their road, and they, too, must be given only the highest praise." As the General spoke, he seemed weary, but proud. For many months, his has been the responsibility for the greatest engineering project ever undertaken by the Corps. of Engineers in wartime. His decisions have determined the course of the Ledo Road through treacherous mountains, jungles and swamp lands where a mistake in plotting the route could easily have meant disastrous loss of precious time and equipment. Pick is a soft-spoken southerner with a mild manner and an easy smile. But, behind his seemingly slow, studious approach is a hard-headed business sense and an ability for organization and getting things done. It was this reputation which resulted in his being relieved of his job as division engineer of the Missouri Valley flood control project in 1943 and the subsequent assignment as commanding officer of the Ledo Road project. This job was a tough one - a "hot potato" - which threatened to burn anyone's fingers who touched it. The road had been started in December of 1942, and when Pick assumed command on October 13, 1943, progress seemed hopelessly stalled in the maze of densely-jungled precipitous mountains. The General's first act was to move Road Headquarters up to the point. Next he instituted a round-the-clock working schedule. When he was told that there was no light for working nights, he rounded-up all the available lighting equipment on the base and shipped it forward. When this proved inadequate, he inaugurated a method of burning flares in buckets of oil - a system which is still widely used for night work along the road. Pick moved up to Road Headquarters when General Joseph W. Stilwell paid his first visit. They met in a rain-soaked tent which served as Pick's jungle office. "Where are your detail maps?" Stilwell asked. "I have none," Pick said. "Where are your progress charts?" "I have none." "Where is the point of the road now?" Pick took a small scale map and marked a point in the shaded Patkai mountain sector. "Here at the 50 mile mark," he said. Stilwell studied the map for a moment, then asked "When can you build me a jeep road to Shingbwiyang?" "I can't build you a jeep road," Pick answered, "but I'll build you a military highway to handle truck traffic." "And when can you get that road through here to Shingbwiyang?" "When do you want it," Pick countered. "Can you get it through by the first of January?" Stilwell asked. Pick said "Okay." Then Stilwell and Pick hiked up to the point. They labored through knee-deep mud, passing dozers stalled in the mud up to the stacks. When they returned, Stilwell turned to Pick and asked, "When did you say you'd get the road through to Shingbwiyang?" "By the first of the year," Pick answered. That first meeting took place November 31, 1943. On the morning of December 27, 1943, the lead dozer broke the tape at Shingbwiyang in Burma's Hukawng Valley, and the engineers had conquered the Patkais four days ahead of schedule. 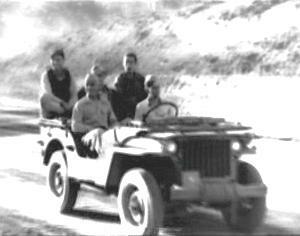 A convoy of 55 trucks carried the first combat troops brought into North Burma by vehicle. The General has managed to transplant his driving determination to get the job done in all the outfits serving under him. He has done this mainly through long hours in the field with the men. During the anxious months of the monsoon, Pick spent most of his time in the forward areas where his engineers were battling the elements. His office at Ledo was seldom occupied. He was at the front where forward elements of his engineer units were working under sniper and artillery fire and bombing and strafing attacks. All that is in the past - milestones of the Ledo Road project. Today, as the General looked over the trucks he has brought 478 miles over the road he has built from Assam, India, to the Burma Road, he probably envisioned the long lines of supplies which will follow over to the Chinese in the days to come.